It’s the end of yet another week and as most regular visitors know, it’s Cake Friday in The Bibby Kitchen. Time to bake. Take a tranquilliser, you might need it. I was tempted to call these treats ‘Lethal weapon bars’ or ‘The bomb bars’ as they’re both lethal and the ultimate, decadent bomb. 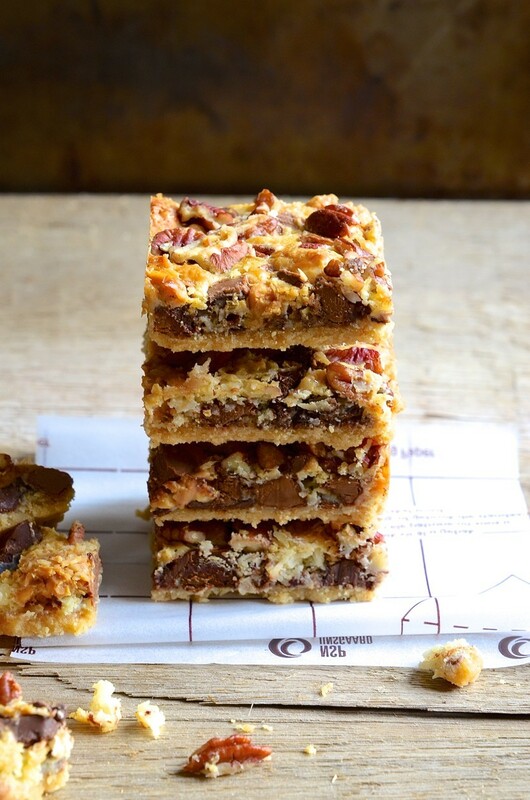 I then realised that there’s far too much talk of weaponry on this site and decided perhaps Magic bars would be more appropriate. This would refer mostly to their super-powers to add pounds, on sight only! You’ve been warned. Generously doused with the sweetest of temptresses – condensed milk and stacked with chocolate, coconut, peanut butter and pecan nuts. Now that I’ve got your attention, let’s put on our big girl pants and bake! Sounds a bit like the Great British bake off, except for the pants part, which I think is a rather practical tip. You’ll have noticed that most of my salad posts come with nutritional statistics and health benefits. This post will be void of any useful information, including or shall I say, specifically, calorie content! In this instance it would be pointless. I’m battling to find any nutritional value whatsoever, except for the nuts but they’re dwarfed by the company they keep. So just shut one eye and pour that ivory coloured milk in and get on with the job. 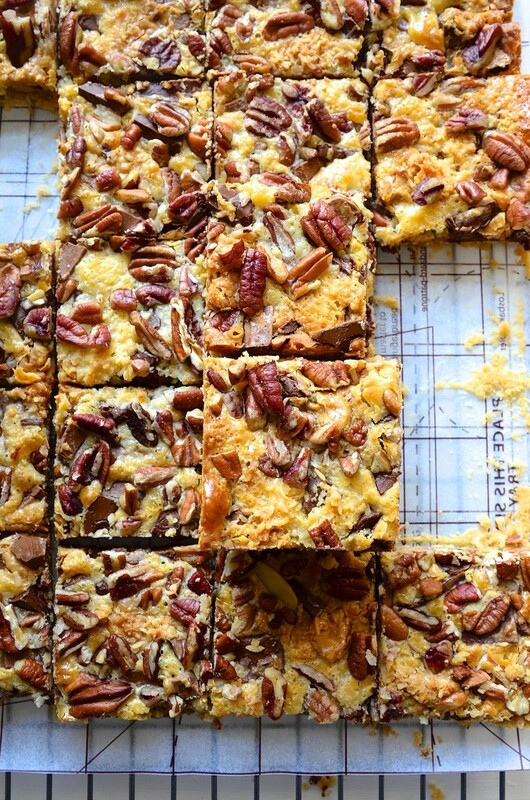 Actually, making these chocolate bars is hardly a job. More of an assembly really. I’ve noticed that many home bakers love a no-bake, quick-bake or one bowl-bake method over tedious recipes that have 101 instructions. This is hardly a Masterchef immunity or mystery box challenge. The only mystery will be the rate at which these munchable chocolate bars disappear! At this point bells should be going off for all those time-strapped bakers in urgent need of a little s.u.g.a.r. Our weekend bake-a-thon is off to a fabulously sweet and simple BANG! Preheat the oven to 170º C. Line and grease a 32 x 20cm baking tin with parchment paper. Process the biscuits to a fine breadcrumb texture. Pour the melted butter over the crumbs and blitz briefly to combine the mixture. Press firmly into the lined tin and smooth over with the back of a spoon. Scatter over the chocolate. Dot with 1/2 teaspoon amounts of peanut butter. Follow with a scattering of coconut. Drizzle the condensed milk over the top and finish with the chopped pecan nuts. Bake for 40-45 minutes. The bars should be golden brown on top. 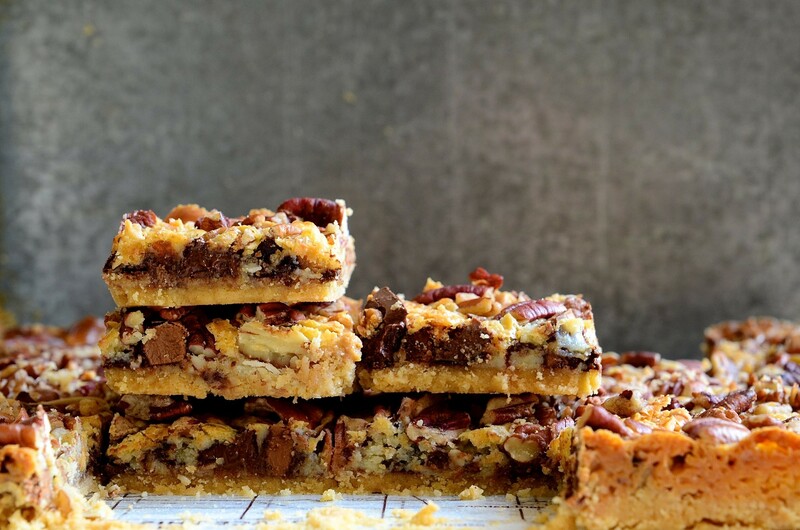 Allow to cool in the tin before slicing into bars or squares. Store in an airtight container in the refrigerator to keep the chocolate bars firm. These bars sound like heaven on a Friday! Recipe just in time for weekend! Thank you Maria. If you have a sweet tooth, this could be just the treat for weekend indulging plus they’re just so easy to make. Happy baking! Yay! And, they tend to disappear at an alarming rate.